The U18 youth basketball preparation phase for France U18 started later than usual with the first official game on 4 July 2013. A total of 24 players were named in the original list. However three key players were missing from the initial training roster: Aby Gaye and Clarince Djabdi Tabdi who are with France U19 and Fleur Devilliers who is injured. At the end of the first training camp France participated in a 4-nation tournament against Croatia, Russia and Turkey. France had no trouble in beating Croatia (64-26) in the opening game. They were pushed a little hard by Russian team in the second game but still came out on top (57-51). Then they finished the tournament by beating Turkey (60-47). Arnaud Guppillotte, the France U18 coach, reduced his training roster to 15 players for his second camp. With a number of players eligible for U18 youth basketball and participating at the U19 World Championship, it is possible that they join the U18 team later. However for the following players the road to the U18 European Championship is over: Katia Clanet, Constance Delbecque, Mégane Hero, Alexia Lacaule, Joanne Lauvergne, Clémence Lefebvre and Margot Videl-Geneve. At the end of the second training camp, France hosted their second 4-nation tournament of the season. England, Poland and Slovenia were the countries invited. 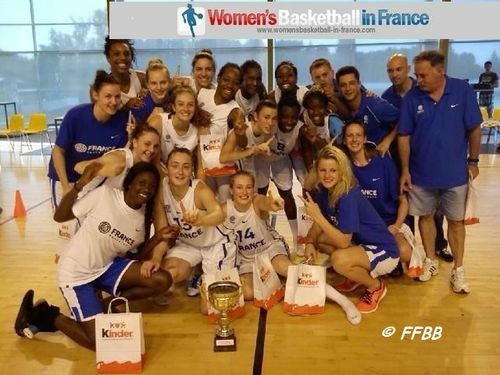 France used a 12-0 run during the third quarter to overpower England and cruise to victory (85-55). Marine Johannes fired in 22 points for France while Janice Monakana knocked down 20 points for England. Poland who are playing in Division B this season edged France (54-53) thanks to a free throw by Angelika Stankiewicz in the last second of the game. France had no trouble to defeat Slovenia (82-38) to wrap up the tournament. Poland finished first by beating Slovenia and England to claim the trophy. France will continue their preparation in Serbia and Poland before travelling to Croatia to defend their U18 European title.